Pick Analysis: Had five tackles and two quarterback hits in 2015 Senior Bowl. In 2014, tied for FBS lead and set school record with 18.5 sacks. Led the nation in quarterback knockdowns with 28. Selected second-team All-American and first-team All-Pac-12 and won the Ted Hendricks Award as the nation's top defensive end. Tied school record with four sacks against UCLA. Finished second on the team with 84 tackles. Started all 13 games in 2013, forcing three fumbles. Selected honorable mention All-Pac-12 in 2012. Arrived at Utah as a 6-foot-3, 200-pound wide receiver. Changed his last name from Fakahafua to Orchard to honor Dave and Katherine Orchard, who took him in and became his legal guardians as a youth. Orchard is married with a daughter. On course to graduate with a degree in economics in May 2015. 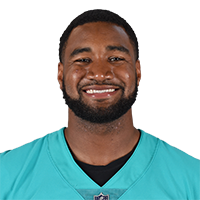 Published: May 1, 2015 at 08:50 p.m.
Former Cleveland Browns defensive back Hanford Dixon helps the team select Utah defensive end Nate Orchard No. 51 in the 2015 NFL draft. Published: March 17, 2015 at 07:58 p.m.
Watch Utah DL Nate Orchard work out at the 2015 NFL Scouting Combine.